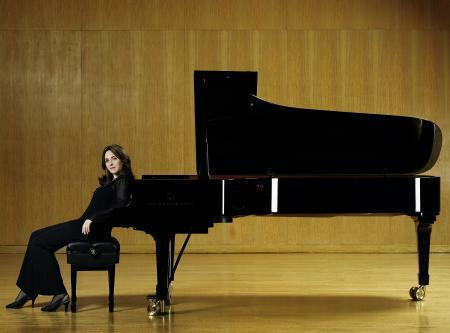 For the near-full house of people who ventured out to Koerner Hall Dec. 12 in spite of the cold, crummy weather, the reward was a mesmerizing performance of Bach’s Goldberg Variations featuring American pianist Simone Dinnerstein. Watching Dinnerstein play this work, written for a two-manual harpsichord in 1742, on a Hamburg Steinway was like watching a mother breastfeed her newborn baby in public. The bond between the two was inseparable, the act intimate and private, and the experience as an observer was one of awe. Dinnerstein, who became famous, for the lack of a better word, a few years ago when she self-produced a CD of the Goldberg, is a rare sort of rising superstar. In her late 30s, she’s a mature artist who gets the listeners’ attention not by dashing her incredible chops, but by displaying her extraordinary tenderness towards and deep understanding of the music. Her Goldberg, all repeats accounted for, was graceful, introvert and expressive. There was considerable rubato a la Schumann, most notably in the aria and aria da capo. Her ornamentation was modern and bubbly in variations like 10 and 14. Her chosen slow tempi were solemnly slow, but thoughtful, fluent and made those fleeting toccata-like variations with serious hand-crossing business that much more thrilling and virtuosic to hear and watch. Variation 28 with 32nd-note trills in both hands was especially feathery and exquisite. Overall, Dinnerstein is a complete artist with total sensitivity. Nothing was rushed — everything was well thought out and executed with the utmost motherly care. She played the Goldberg without an intermission, only taking small breaks on stage to take care of a cough and drink some water and orange juice prepped for her by the piano. Her coughs sounded like she could have cancelled the concert to get well, but, boy, weren’t we lucky she didn’t.